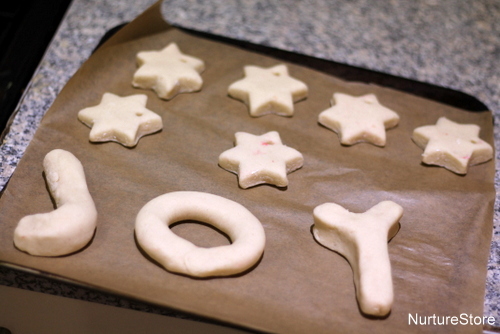 Christmas salt dough recipe :: Joy! 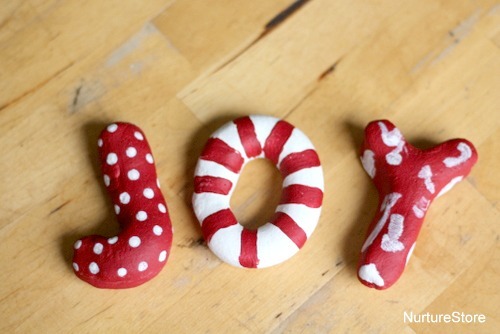 Let’s use salt dough to create a candy cane-coloured set of letters that you can use as decorations or for spelling work. …. Click here …. 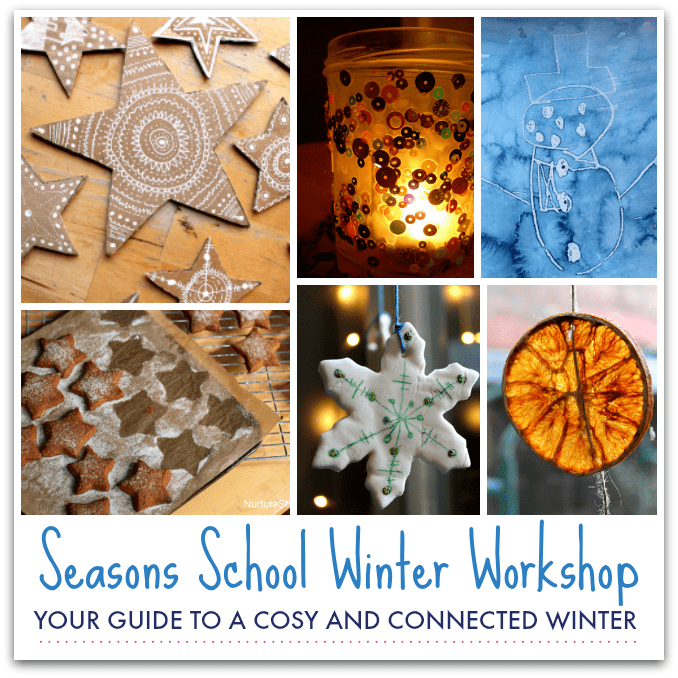 for your guide to a cosy and connected winter with your family. Use a wooden spoon or your hands to bring the ingredients together to form a dough. 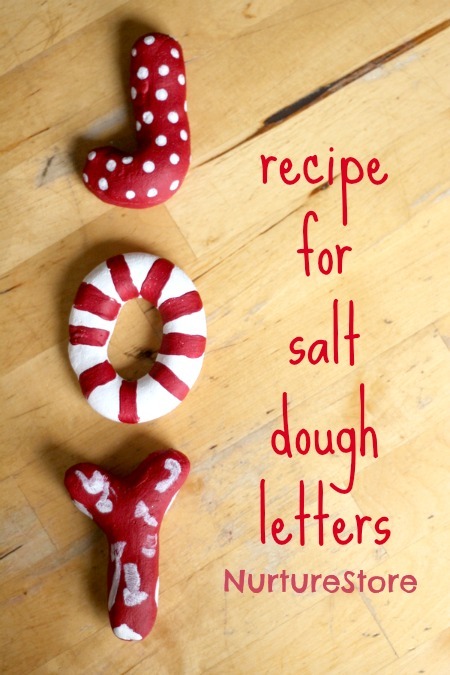 Then you can use the dough to make any shapes, numbers or letters you like. You might like to make a whole alphabet. 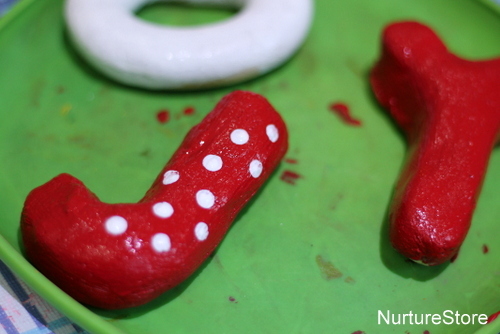 Once they’re baked and cool, paint your shapes with red and white acrylic paint. You can use different patterns of spots, stripes and swooshes. Add a layer of Modpodge or varnish if you would like, for extra durability. Let’s make this winter the year when we delight in the cold and the dark. Gather your children, get cosy, and make memories and connections together. …. CLICK HERE FOR YOUR GUIDE …. Looks lovely. We try that today. Thank you for sharing. Thank you so much for another fantastic recipe for the books!! We are making these for everyones christmas gifts this year. (Extremely tight budget but grateful for every dollar;) These will make lovely keepsakes for the family & wonderful fun for the kids to make too! These look lovely! Am going to have a go myself this afternoon. Have a quick question for you… I have a load of gluten free bread flour to use up – have you any idea if this could be easily substituted for the plain flour? Our entire family had soooo much fun decorating these together today and they look amazing. Even the 3 year old’s came out nicely!! Easy to make and a great project every one can take part in and enjoy;) thanks! That’s wonderful Jess! I’m so glad you all enjoyed it. Happy Christmas!